You Can’t Handle It Now! Up very early on a fresh spring morning, I looked out my kitchen window to check on the progress of the lilacs planted against the fence and my neighbor’s garage. Then I saw her, coming out from under my neighbor’s garage to grub under a large stump in our backyard. Mama Skunk had a family to feed. Mama Pastor had a little nutty. I was getting ready to sell my house. 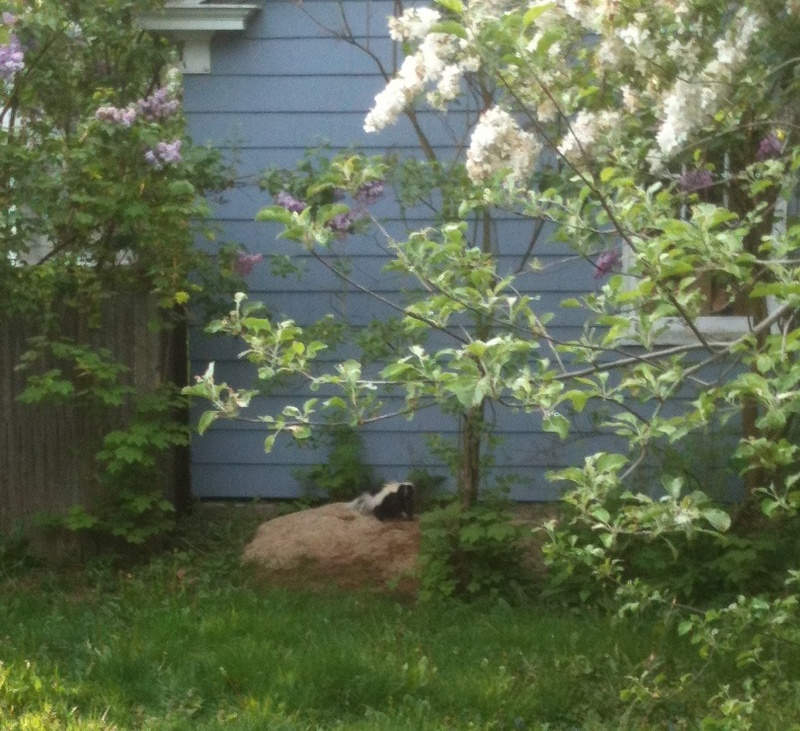 Could there be a less thrilling inducement to buy than a skunk family whose front yard is in the backyard? Despairing, I turned to Facebook for some crowd-sourcing. “What can I do about a skunk in my yard?” Friends and “friends” offered sympathy and suggestions, as well as reviews of the kind of people who help relocate unwanted wildlife. I couldn’t handle it just then. More than once, I’ve sat by a hospital bed listening to someone tell a story that sounded just like my mom’s. She died twenty years ago, a fair-skinned blonde whose little mole on a shoulder blade became metastatic melanoma that took her from us. In the waning months of her life, she confided that she had searched her heart to determine what she had done wrong; why was God punishing her? There must be some reason. She trusted me with her fear. I wasn’t sure I knew how to handle it then. 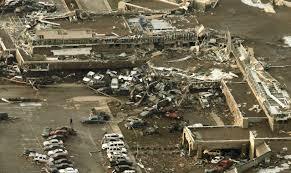 The hospital in Moore, OK. The average warning time people get before a tornado is about fifteen minutes. Last Monday, in Moore, Oklahoma, school officials and hospital administrators and business owners had to decide in a flash the safest places for students and patients and employees. People at home went to their shelters, or ran to their neighbors hoping to be allowed into safety. They had to handle it, whether they felt ready or not. • I am going to the Father. • Soon you won’t see me, but you will again at some unspecified time. • Meanwhile, love one another as I have loved you. • And because all of the fancy specifics of who I am and what it all means are too hard for you to comprehend, God will send the Spirit, otherwise known as the Companion or the Advocate, who will be with you always. For centuries people of faith wrangled about the meaning of all this, eventually arriving at the Doctrine of the Trinity, that mystical notion that God is three persons, traditionally described as Father, Son and Holy Spirit. God is One, but God is also Three: Creator, Redeemer, Sustainer. I’ve used these strings of words many times, but what do they really mean? I hear this as developmental. Humans mature in faith understanding just as they mature in practical understanding. God can wait for us to get there, but not in the person of Jesus. He needed to move on to the inevitable end of his human existence in order to show us a different way of being God. Jesus showed us divine vulnerability. Divine vulnerability allows our relationship with God to be at its worst, yet still be a relationship. He did not leave us alone to flounder, even if he did leave us to wonder how God the Creator, God the Christ and God the Holy Spirit are all three God, but at the same time One. Once I understood the parameters of the skunk situation, I became more peaceful about it, even when the traps remained empty for days on end. The goal of my New Best Friend was to catch Mama Skunk, then find her little ones and transport them all together to a wildlife rehabilitation center. Later they would be released into the wild, somewhere far from the densely settled neighborhood where I lived. Or, they might move on their own, far enough away. For a time the outcome remained unpredictable, but my New Best Friend promised they would not live in my yard forever, and I trusted him. In fact, when the initial shock passed, I came to wish we could all live together in peace, even though I also wanted to be able to let the dog outside. It’s hard but essential to hold seemingly conflicting ideas in balance. The Trinity asks us not to get stuck in what seem like facts. We get in trouble when we get too set in our minds, too sure of our definitions of what works and what doesn’t. Those things only work until we reach the next stage. And there is always a next one. Jesus knew how hard it was going to be for the disciples, but he also knew they would not be alone. He knew that just as he had come, part of God’s own self, to live in human form, so would the Spirit, also part of God’s own self, be available to his friends. It wasn’t just for that spring in Jerusalem, or the next five years, or the next three centuries. The Spirit is here with us. 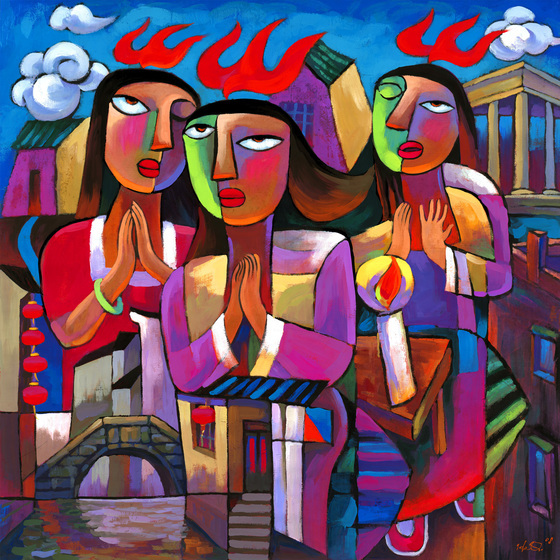 Of all the Three Persons of the Blessed Trinity, the Spirit is the hardest to capture. God the Creator, the Divine Parent, the Source of All That Is might be visualized as a force or a white-robed grandpa or a wild-eyed wonder-worker or a great, big-bosomed mama – our imagination is the only limit. We have a world of artwork and stories that aim to put flesh on Jesus, to help us relate to him as the Good Shepherd or the man with the children gathered around him, even as the person suffering on the cross. But how can we picture the Spirit? Scripture calls the Spirit Fire and Wind; it’s elemental. Scripture calls the Spirit Companion, Advocate, Comforter – claiming God’s presence with us in times of isolation, trial and loss. I would add Inspirer, Instigator, even Provocateur; the Spirit is God present among us, urging us toward deeper faith and wider action and greater understanding. 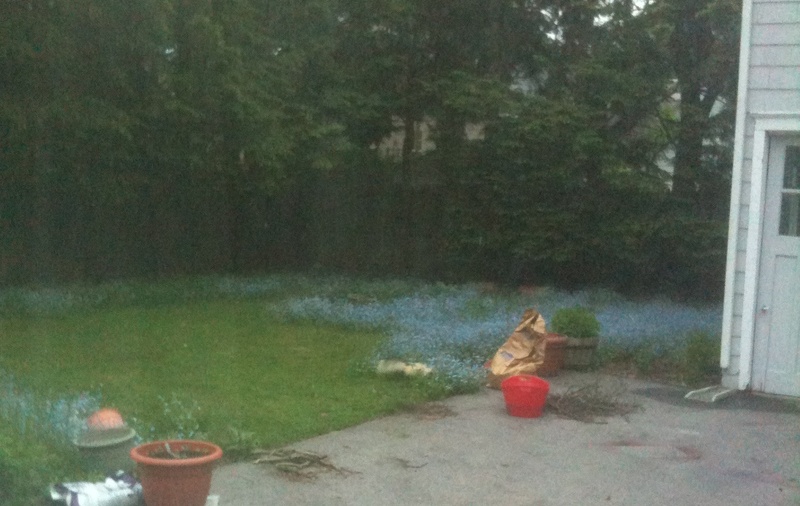 There are going to be skunks in the yard. There are going to be things we feel we just can’t handle. Those are the times we especially need the Spirit of God. We can’t handle it, not alone. But God will allow things to unfold at the right time, when we’re ready. In the Spirit of Truth and Love, there is a New Best Friend better than any other. This is the Good News: the Spirit will be with us, no matter what may confront us, whether it’s skunks or lingering grief or natural disasters, or all of them at the same time. When we need to grow in knowledge or understanding, when we need to love truer and believe deeper and trust harder, we are not alone. In the company of God’s Spirit, we can handle it. Amen. This is a fantastic sermon – I believe one of the primary attributes of the HS is to be unknown to us. I got an A on a paper in seminary with that premise. Not sure how I missed this one. Just beautifully composed my friend! AMEN!